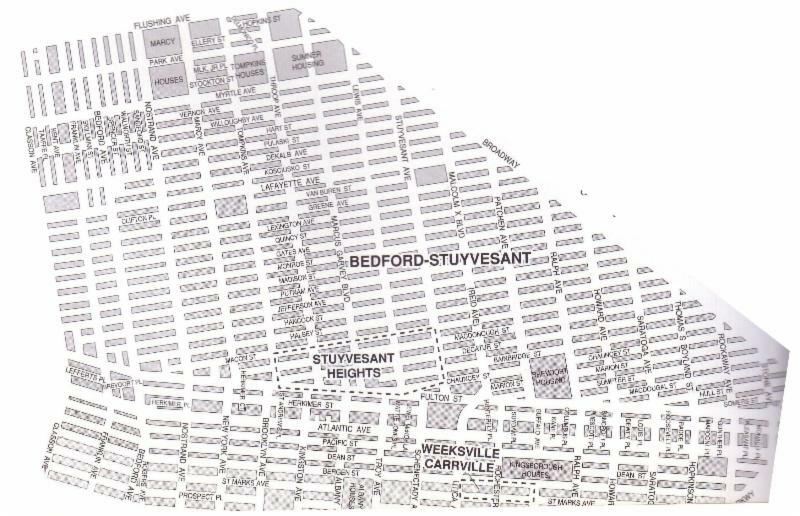 DEVELOPMENT: Many areas in Bedford Stuyvesant are prime for development. The Gold Coast in the southwest corner of Bed Stuy is home to 800 residential buildings in Italianate, Queen Anne, Romanesque Revival and Renaissance Revival styles. The Landmarks Commission has proposed designating a 16-block area bordered by Gates, Fulton, Bedford and Tompkins Avenues.This corridor of mainly prime Brownstones have doubled in value from $800K a few years ago to an average price of $1.5 million today. Ripe for development: Along Bedford Ave corridor, streets like Gates, Quincy, and Lexington, areas off the G train like Dekalb and Nostrand, and the Bed Stuy/Bushwick border, divided by Broadway and serviced by the J, M and Z trains. Both sides of Broadway are seeing tremendous development as developers are scooping up land at values in the $100 – $150 PSF range. DEMOGRAPHIC: The neighborhood, served by Community Board 3, is still populated by mostly lower-income families (approximately $50K), many of whom have owned their home for several generations. PRICES: The last condo sales in Bed Stuy went for an average of over $800 per square foot. Here the average property size is 900 square feet and comes in at $750,000 per unit. On rents, the average price per square foot is $50, with average unit size at 700 square feet and an average rent of $3,000 per month. TRANSPORTATION: Bed Stuy is well served by public transportation. The closest subway is the C train at the Franklin stop and an A train that stops at Nostrand. There’s also an elevated shuttle at the Franklin stop that takes riders to Eastern Parkway. The B44 bus line runs from Williamsburg all the way through to Sheepshead Bay. Citibike is also well represented here and popular with the new arrivals. AMENITIES: The Associated Foods supermarket on Fulton Street has undergone a complete makeover with a refrigerated craft beer room, an increasing amount of organic offerings and a Brooklyn Roasting coffee station. RESTAURANTS: Bed Stuy has several destination restaurants: Saraghina, an Italian restaurant known for its wood-fired pizza oven, makes dried meats on the premises; Peaches Hothouse offers a gourmet take on traditional soul food; Do or Dine, an inventive fusion restaurant, is run by a trio of pedigreed twentysomething foodies, including Justin Warner, Food Network Star Season 8 Winner. One gets a real sense of the area seeing a couple dozen people in line at Scratch Bread, a bakery that serves gourmet brunch in a cup for $5. It’s become easier to spend $11 on a cocktail at new spots like Doris, a stylish mid-century modern venue on Fulton, and at Bedford Hall, a library-like lounge with a full kitchen, or at the gay-friendly One Last Shag on Franklin. Too often, real estate investors don’t get the full story. While Competitive Market Analysis remains an important indicator, several factors illustrate why rapidly gentrifying properties in North Brooklyn (Bed Stuy, Crown Heights, Prospect Heights, Clinton Hill, Bushwick) need to be valued by additional factors. The net worth and disposable income of incoming residents is 500X what it was a decade ago. With two-bedroom apartments in Manhattan priced over $2 million, couples earning less than $1 million are moving to Brooklyn’s A+ neighborhoods (Williamsburg, Carroll Gardens, Brooklyn Heights), so the half-million dollar two-bedroom makes sense in these emerging areas. While retail isn’t a leading indicator of a changing population, it is responsive to the needs of a community; we’re seeing that first in the form of cafes, bars, restaurants and organized activities for children and adults. Bedford Avenue, Fulton Street, Franklin Avenue and Classon Avenue are all ripe for retail development as the residents here need to be able to spend their money in places closer to home. Lack of inventory remains a primary driver, but it’s only getting worse. Banks weren’t lending on condo projects after 2008. While there’s a trickle and now condos will be built, it’s not nearly enough. We only need to look at 50-100 people attending an open house. Compounding this crisis is the trend of those who would traditionally move to the suburbs deciding to stay in Brooklyn, as the quality of life is now more conducive to raising a family in Brooklyn. New York City gained more people than it lost for the third straight year, pushing the population above 8.4 million. This reverses a trend that goes back to mid-20th century, according to The New York Times. A large contributing factor is the influx of visitors from around the globe. Brooklyn is enjoying a renaissance around shopping, eating and culture. Add improved safety, better transportation-thanks to innovations like the Water Taxi-and you’ve got a place with lots to do and easy accessibility. As the Brooklyn brand expands, with artisanal food, drink and into other demographics like sports with The Nets, different kinds of people are visiting and seeing it as a better alternative to Manhattan. Schools have been good in areas like Park Slope, Brooklyn Heights, Greenpoint and a few other nabes, but as more families have moved into Fort Greene, Clinton Hill, Kensington, Bed Stuy and Williamsburg, parental involvement, through parent associations, has helped improve the quality of the schools.